Legendary broadcaster Vin Scully was honored at Dodger Stadium in Los Angeles, CA Thursday night (July 28) with an event befitting his status as a baseball Hall of Fame announcer. The crowd was treated to a full set from Rock and Roll Hall of Famers Fleetwood Mac, their first concert since their November 2015 dates in Australia and New Zealand. 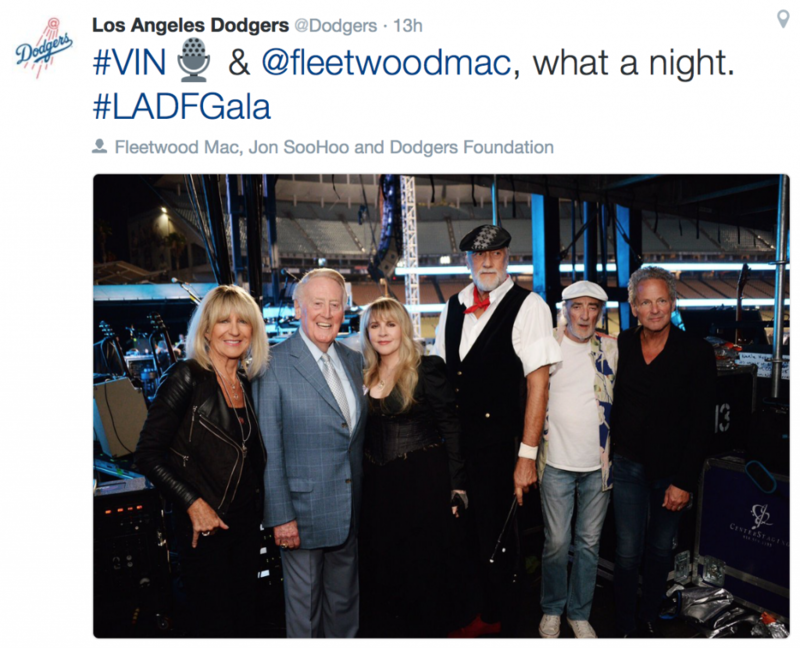 Earlier, Scully, who at 88-years-old still does play-by-play for many Dodgers’ games – his 67th season with the team, dating back to when the team still played in Brooklyn, NY – was feted by an all-star group of celebrities and Dodgers greats. That list included Matthew McConaughey, Arsenio Hall, former Dodgers ace Orel Hershiser, Sylvester Stallone, John Mayer, and more. The event honoring Scully was the second annual Blue Diamond Gala for the team’s Foundation. The VIP pricing meant that a crowd of only roughly 1000 attended the performance. Back to Scully. The legend has indicated that this will be his last season calling Dodgers games (but he’s said that before). He has called three perfect games and 19 no-hitters as well as Hank Aaron’s 715th home run in 1974 that broke Babe Ruth’s then-record home run total of 714. Want goosebumps? The benefit performance was Fleetwood Mac’s only concert of 2016. The Mick Fleetwood Blues Band has scheduled a tour for September and October. Thank you from me in LEICESTER UK for sharing .